Milan is recognized as the world’s fashion and design capital. 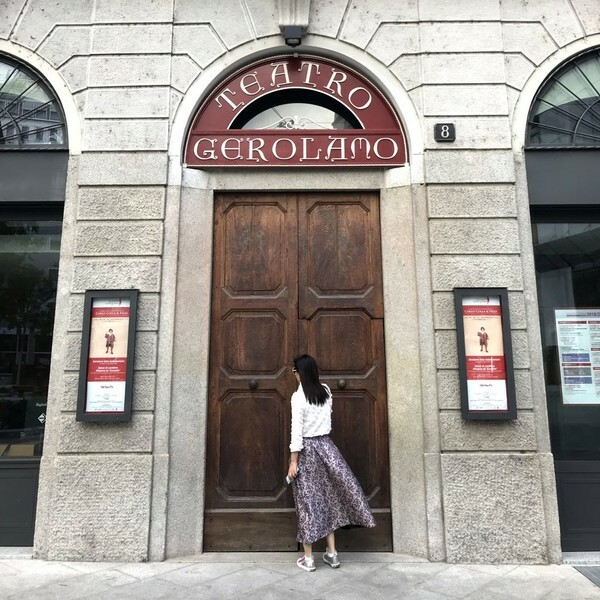 It is home to top luxury brands such as Armani, Prada, Versace, Dolce & Gabbana, Moncler, etc.. Milan also housed a number of world-class design schools, such as Marangoni and IED, together with countless art galleries, and renowned museums. Elegant and stylish Italians are everywhere on the street. Milan Fashion Week is also known as one of the most important fashion weeks in the world. 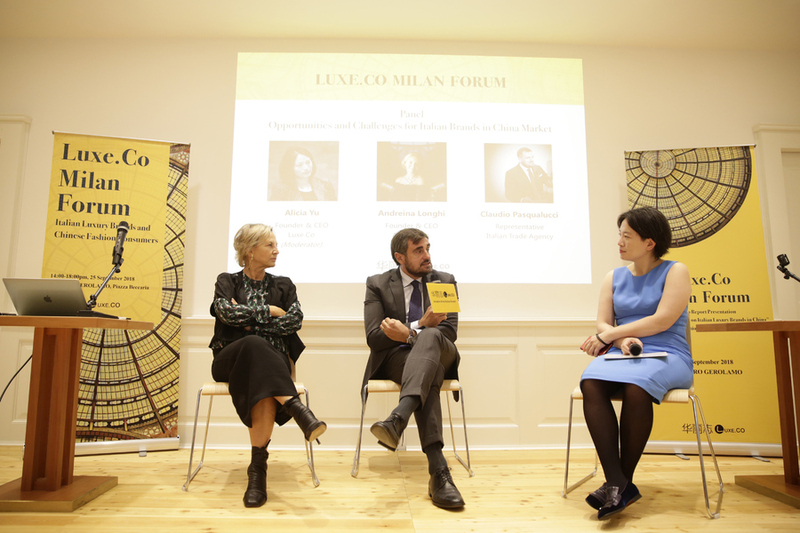 During this season’s Milan Fashion Week, Luxe.Co Milan Forum took place on the 25th of September . 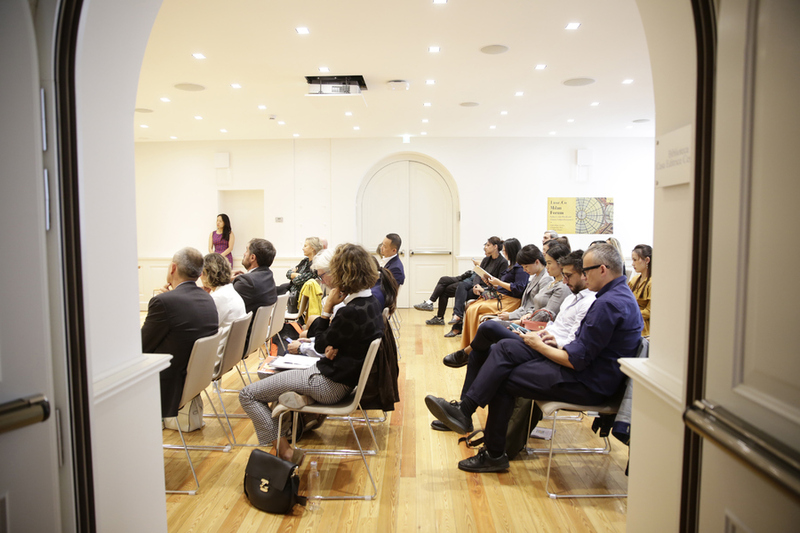 The forum brought together Italian fashion veterans, luxury and fashion brand executives, government officials and industry experts to discuss in depth the opportunities and challenges of Italian luxury brands in China. 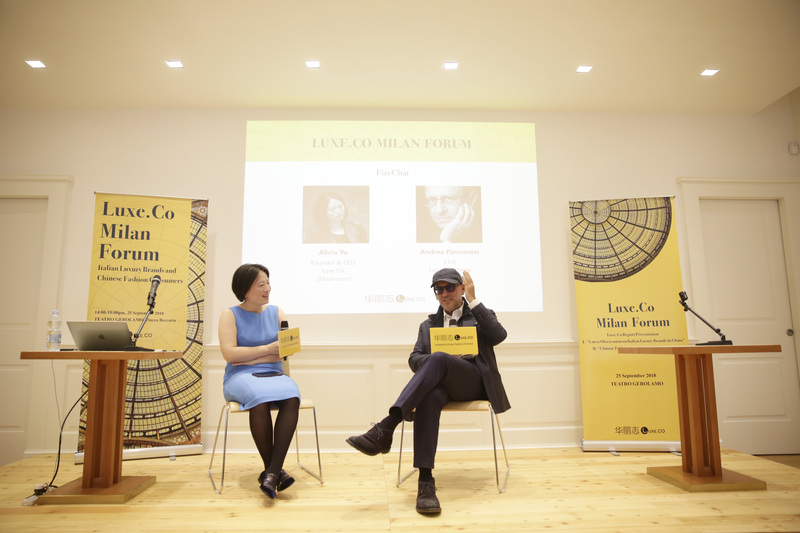 Over the forum, Luxe.Co presented in English two proprietary reports: “Italian Luxury Brands in China – Luxe.Co Observation 2018” and “Luxe.Co China Fashion Consumer Survey 2018”. Guest speakers included Andrea Ponconesi, CEO and sole owner of LuisViaRoma, a famous luxury brand e-commerce company from Florence, Andreina Longhi, founder & CEO of Attila&Co, a renowned fashion communication company from Milan, and Claudio Pasqualucci, representative of the Italian Foreign Trade Commission. The honorary chairman of the Italian National Fashion Association (the organizer of Milan Fashion Week) – Mr. Mario Boselli, among many other distinguished guests, also attended the event. 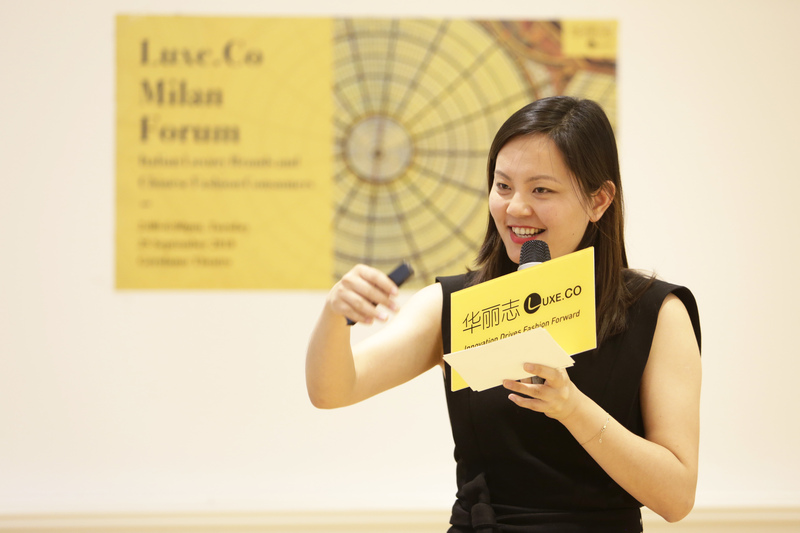 Alicia Yu，Founder and CEO of Luxe.Co，presented the special report “Italian Luxury Brands in China – Luxe.Co Observation 2018” at the forum. This is a first report dedicated to the performance of Italian luxury brands in China. 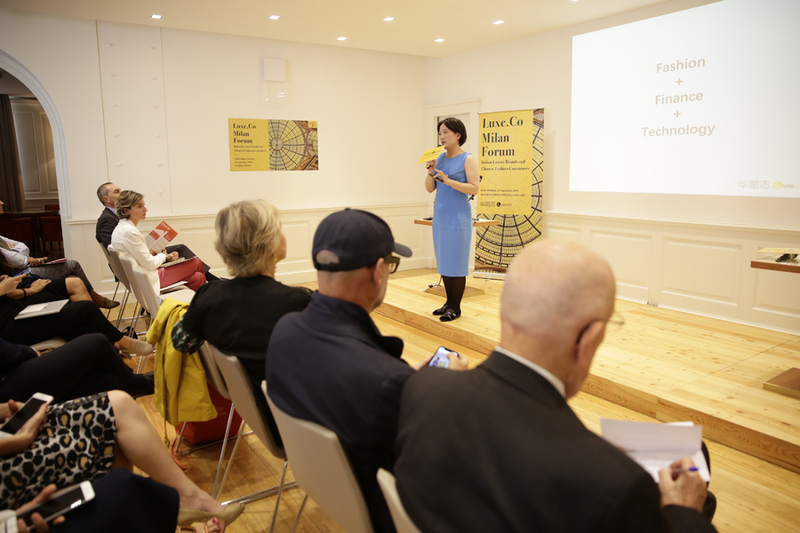 In the eyes of Chinese fashion consumers, “Made in Italy” is a magical phrase that embodies the unique history, culture, art, landscape, lifestyle, and craftsmanship of the Apennine Peninsula. The new generation of Chinese consumers not only admire the big luxury names, but also love all things with superior quality and unique design from Italy. 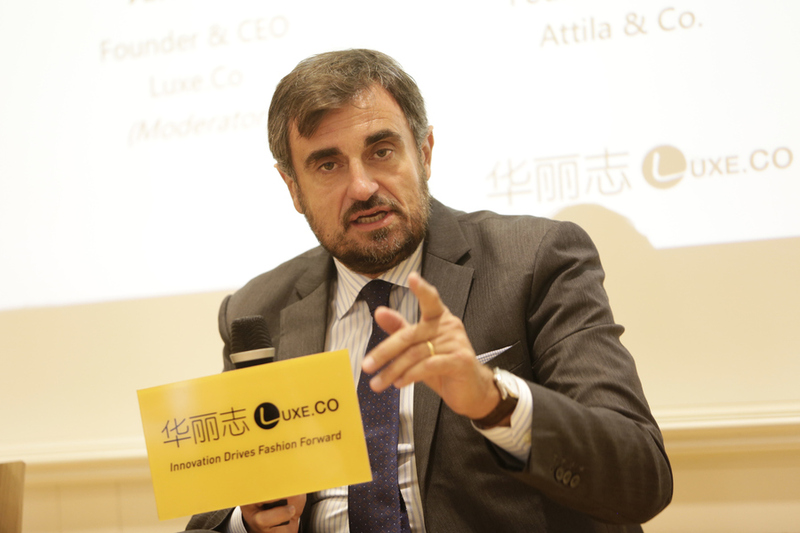 “Italian Luxury Brands in China – Luxe.Co Observation 2018” unveiled the business performance and growth potential of 50 Italian top brands in China, including market penetration, offline stores, online channels, social media performance, and spokesperson strategies, Detailed data and specific cases revealed the marketing initiatives of these leading brands in China and the effectiveness of interaction with Chinese consumers. Alongside the data collected from open sources, Luxe.Co also conducted a special survey on the subject of “Italian luxury”, the main findings are included in this report. A total of 729 responses were collected online over one week’s time. According to the survey outcome, Italy is voted as No.1 country when it comes to luxury goods; and “Made in Italy” chiefly represents high-quality craftsmanship, historical heritage, and artistry. 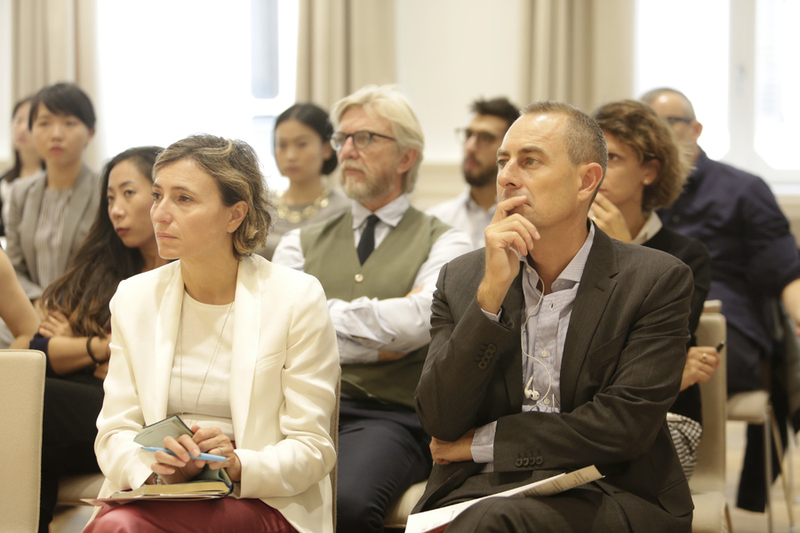 Andrea Ponconesi, the CEO and sole owner of the famous luxury brand e-commerce LuisaViaRoma, made a special trip to Milan from Florence to participate in this forum. As the third generation heir, Andrea Panconesi is still passionate about the family-owned business. In response to the question on multi-brand retail strategy came up by Alica Yu, he mentioned that the true meaning of fashion underlies within the diversity of brands. 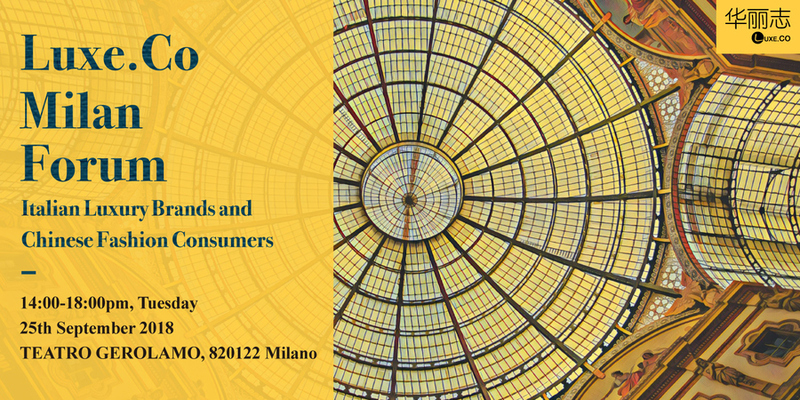 With the unique history and culture, Italy is poised to be the country who has the best multi-brand retail ecosystem. In 1999, Andrea Panconesi launched the luxury shopping website LUISAVIAROMA.COM, the world’s pioneer in online fashion retail. Today, LuisaViaRoma, with a history of 88 years, has accounted for more than 95% of online sales, and China is its third largest market. More importantly, he has been practicing online-offline integration ever since then. Next, LuisaViaRoma will launch a Pop-Up Smart Store in New York. 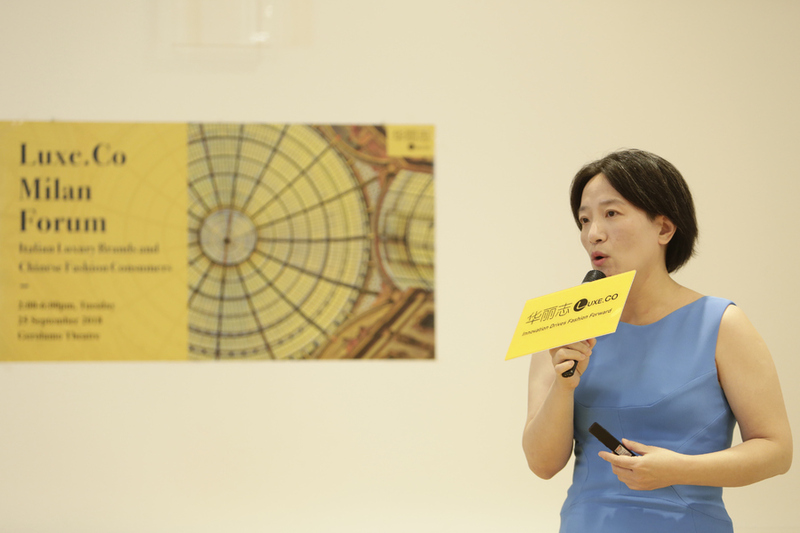 Elisa Wang, fashion director of Luxe.Co, presented the outcome from “Luxe.Co China Fashion Consumer Survey 2018”, which is sponsored by the Chinese fashion brand PEACEBIRD. 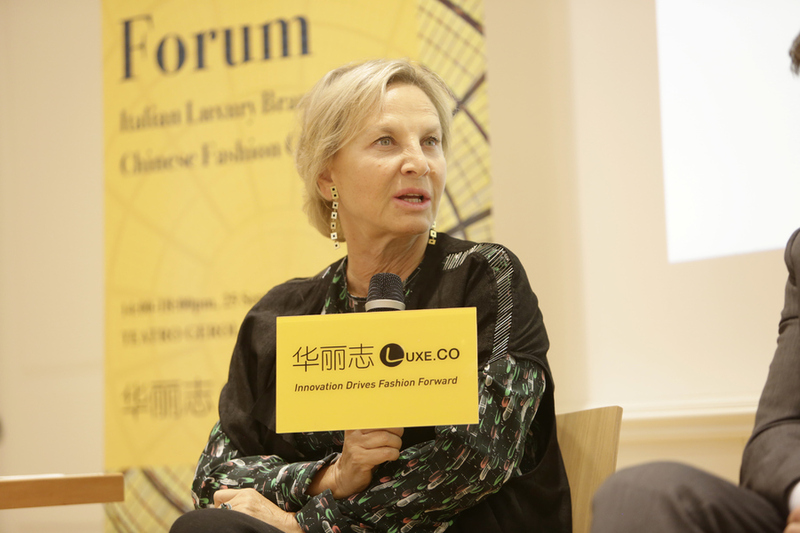 This is the third consecutive year that Luxe.Co has conducted in-depth research on young fashion consumers in China. “Over the years, Luxe.Co has been systematically tracking global fashion and luxury industry with China angle. Thanks to our professionalism and dedication, many decision-makers、senior executives、entrepreneurs and investors in the industry have become loyal readers of Luxe.Co, and actively interact with us on regular basis. For every brand, answering the demand of the new generation consumers is key to future success. Mrs Andreina Longhi, founder and CEO of Attila&Co, a renowned fashion communication company based in Milan and Shanghai that serves Italian and global luxury and fashion brands including Valentino, Versace, Gucci, Boucheron, Montblanc, P&G, L’Oreal, etc., Attila established its Shanghai office in 2003 and has been collaborating with Chinese clients since then. In recent years, Attila&Co. has been working closely with independent Chinese designer brands to assist in their global promotion. Ms. Andreina Longhi, Founder and CEO of Attila&Co. Mr. Claudio Pasqualucci, representative of the Foreign Direct Investment Department of the Italian Trade Bureau. Claudio has previously served as a trade commissioner in China and has lived in Shanghai for many years. 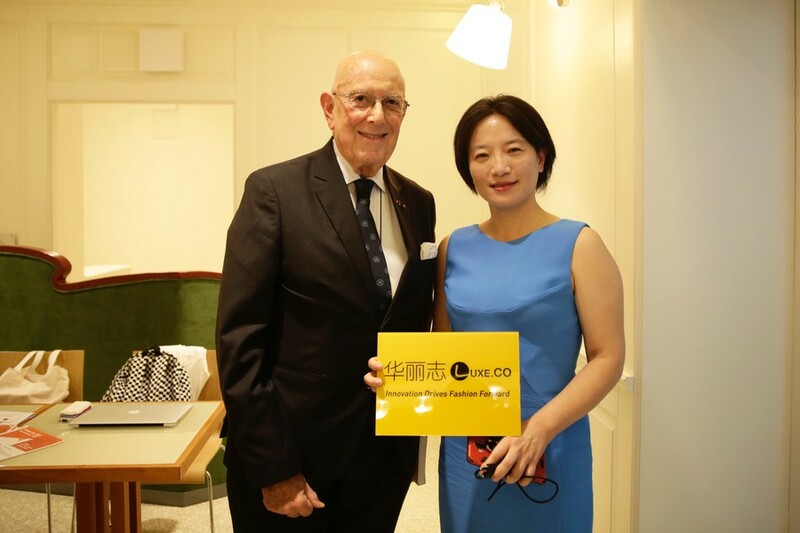 His main responsibilities include promoting trade relations between China and Italy and promoting Italian exports. 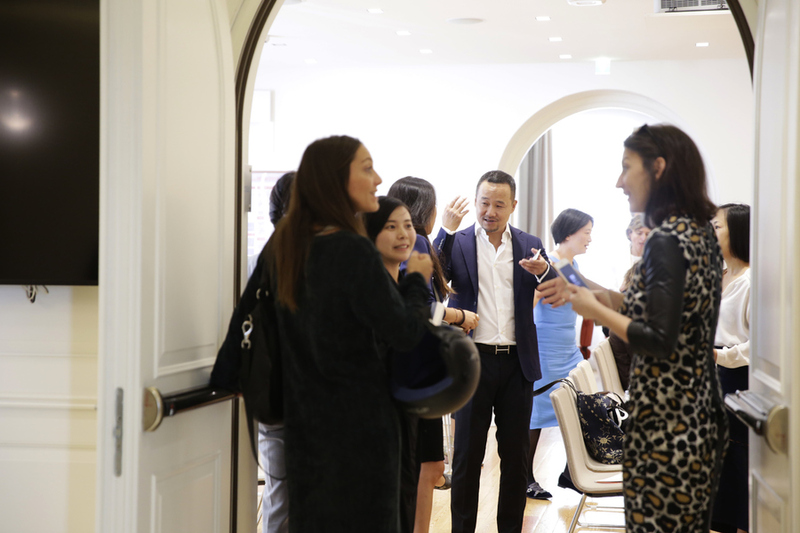 Both guests have worked closely with the Italian luxury industry, while accumulated rich experience in China market. Chinese luxury consumers are becoming more and more mature. The two are particularly optimistic about the development of Italian leather goods and accessories in China, but at the same time pointed out that, if these brands want to penetrate China market, they need to make relevant investments, and put up excellent local team. The two also believe that more and more fashion brands “Made in China” will go global in the future.